This week I wanted to try something new and do a "Friday Five" post. I love to see what people are loving on a week to week basis because it's generally more personal and unique than monthly favorites. My first thing I'm absolutely loving is actually a doozie (there that problems it's making choices again! ), and it's the song "How Long Will I Love You" by Ellie Goulding and "Wasting My Young Years" by London Grammar. The first time I heard both of these I was like "they're so weird and I'll never like them" but flash forward about a week of listening to them and I'm obsessed! Both of them are so well performed and the sound is just haunting. They've been stuck in my head all week. Speaking of London Grammar, I found them because not only have they been on the side of my YouTube screen forever but they were featured on my new favorite show Reign. 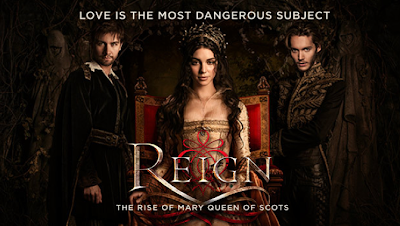 It's a bit cheesy, but put royals, the 1500s, and killer costumes together, and you've got me hooked. It's basically a full proof formula. I'm still waiting to see how closely the show will stick to actual history, but so far I really like it and the actors and actresses are gorgeous. And can we just discuss the wardrobe?? Next up is Glade Pure Vanilla Joy. I am in a Glade phase lately and I've been lucky that everything I've bought has been great. I brought the spray form this time because let's just say 3 illegal candles in a dorm with extremely sensitive fire alarms is quite enough. I am impressed with it though and the smell is very strong, which I like as I don't want to be spraying it every 10 minutes, but light enough to not be overpowering. It's the perfect Christmasy scent and since my roommate and I have been burning candles (oops), turning on Christmas lights, cranking the heater, and listening to Christmas music all week, it's been perfect. This is the visual description of how I feel about it. 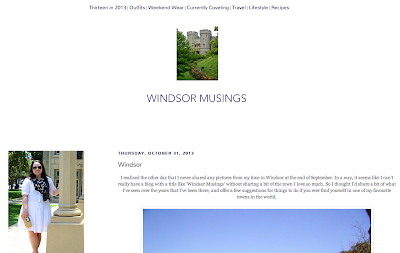 Okay, if I had to choose the thing I got most excited about this week, it's this new blog I found called Windsor Musings. 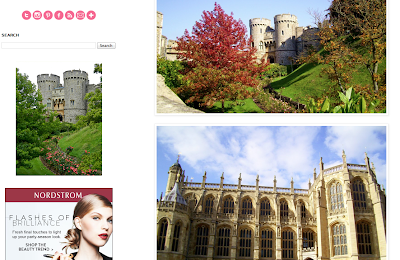 I have this habit of researching everything into the ground, not surprising at all, I know, and seeing all her pictures and posts of pretty places in England is so amazing. She is studying British history at Cambrige (and living there, obvi) and I would be totally content to just follow her path except with law! I cannot lie and say I haven't obsessively checked her blog all week for new posts. What homework? Sorry, not sorry. Last but not least, I really love this new video from Louise (of Sprinkle of Glitter) and Zoe (of Zoella280390). I know I've previously mentioned one of Louise's body confidence videos but I just love this one too. Especially when she talks about how there is no need to question why someone's body is the way it is, it just is. Some people are tall and some people are short. 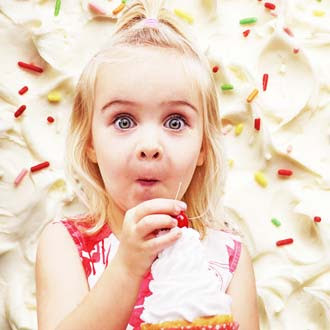 Some people are slimmer and some people happen to be a bit heavier set. No one gets to pick their genes (so really the people everyone envies had no part in that) and what you may find attractive, someone else may feel the exact opposite. I feel like if more people realized that there would be a lot less bullying and hurt feelings in the world. That's all I have for you this week! I hope you enjoyed getting to see all the things I've been loving this week. What have you been loving this week? Any recommendations on things I should check out? London Grammar are one of my favourite artists - I saw them at a festival this sumer and Hannah Reid's voice is beyond incredible live! Sitting on the banks of a valley at midnight listening to them is definitely one of my all time favourite memories! omg you're so cool! I love them just sitting in my dorm room so I can only imagine!